Last year was very well attended, youth and community engaged extremely well and everyone learned some new useful information. 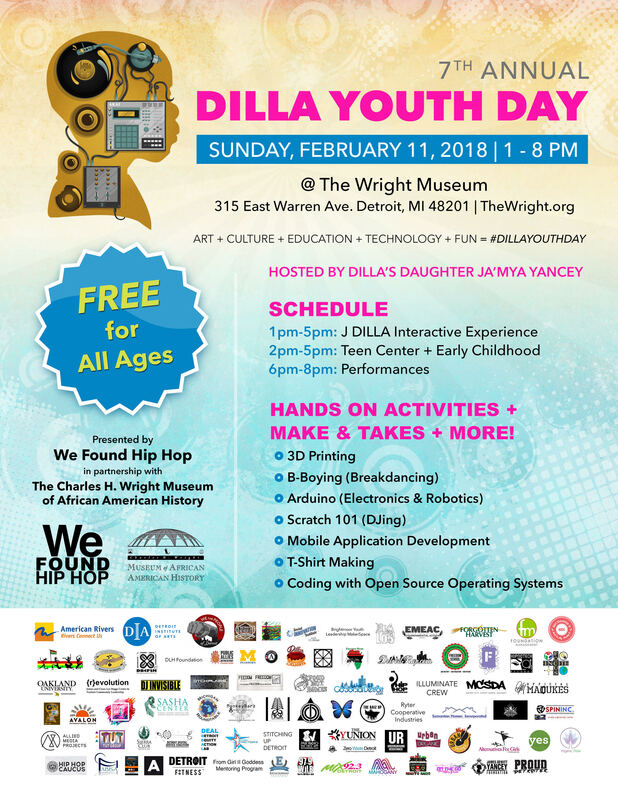 This event is now in it’s 7th year, and for the fourth year in a row with over 1000 attendees, We Found Hip Hop is partnering with The Charles H Wright Museum to celebrate Dilla Youth Day. J Dilla is a significant African American Musical Producer who created the genre Neo-Soul and revolutionized the sound of 90’s Hip Hop. He accelerated the careers of successful artists such as Erykah Badu, Common, Talib Kweli, DeLaSoul, Janet Jackson, and influenced many others up to our current generation. How much does it cost the Youth? NOTHING. There is no cost to youth groups who choose to participate. This is a wonderful opportunity to support Michigan’s young people. And it is a wonderful opportunity to promote the work of various community youth groups doing great work in the city to a very receptive 1,000 attendee audience of parents, educators, artists, community, and of course youth. What types of workshops are we looking for? The event is organized into “spaces”. • a Teen space 2pm-5pm in a classroom these are 60 minute & 90 minute focused instructional workshops. • an Early Childhood learning space drop-in 1pm-5pm for children age 6 and under with hands-on making activities. • an open multidisciplinary multi-age space 1pm-5pm in the multipurpose room with drop-in hands-on beat-making, design, and maker space activities. • Electronic Keyboard Programming drop-in 1pm-5pm in the Orientation Theater. • a movement/dance space in the Atrium 1pm-5pm with a dance floor and various open movement instruction in 30/45 minute intervals. • and Youth Performances 6pm-8pm in the GM Theater. Is there any compensation available? there is no monetary compensation for organization participation, however we offer a meal and a free vendor table to organizations who wish to promote their organization and programming and do sign-ups. Any particular theme outside of STEAM? Yes, we concentrate heavy on The “A”= Arts so we welcome any engaging arts programming in all disciplines. We also concentrate heavy on the “E” = Engineering and super appreciate any low-tech or mechanical or Critical Thinking activities. NOTHING. There is no cost to youth groups who choose to participate. This is a wonderful opportunity to support Michigan’s young people. Please help us bring this wonderful opportunity to 1,000 attendees on Dilla Youth Day–and then across Detroit. Parents, Caregivers, Families, Youth Workers, Youth Groups, Science Teams, Music Schools, Robotics Teams, Educators, Community Based Organizations, Faith-based Organizations, Media, Beat Makers, Music Lovers, Dilla Fans, DJ’s, Emcees, B-Boys/B-Girls, Graph Writers, Hackers, Tinkerers, Scientists, Students, Music Producers, Computer Programmers, Innovators, Curators, Musicians, Artists, Prevention Workers, Teachers, Social Workers, and Anyone Interested in Improving Community Through ART, + You. Previous Celebrating Dilla Youth Day 2017 Featuring thestudioArena Mobile Maker Space at The Charles H. Wright Museum of African American History.